Season steaks with salt and pepper. In 10-inch skillet, heat oil over high heat. Add steaks; cook 2 minutes on each side to brown. Remove steaks; refrigerate 30 minutes. Meanwhile, melt 2 tablespoons butter in same skillet over medium-high heat. Add 2 tablespoons shallot and 1 clove garlic; cook and stir about 2 minutes or until softened. Add mushrooms, prosciutto and thyme; cook and stir 3 to 4 minutes or until mushrooms have softened and any liquid has evaporated. Transfer mushroom mixture to bowl; refrigerate 10 to 15 minutes or until completely cooled. Line large rimmed cookie sheet with cooking parchment paper. Roll puff pastry sheet to 20x9 inches; using sharp knife, cut out two 9-inch rounds. From scraps, cut out leaves or other shapes to use as decoration. Place pastry rounds and decorative cutouts on cookie sheet. Place in freezer 5 minutes. Heat oven to 400°F. In small bowl, beat egg and water. Remove pastry from freezer; brush each round with 1 teaspoon mustard. Place generous tablespoon of the mushroom mixture in center of each pastry. Place a steak on top of mushroom mixture on each pastry round; top each steak with another generous tablespoon mushroom mixture. Brush edges of each pastry round with egg wash; fold pastry over steak so dough edges slightly overlap and steaks are completely enclosed. Place on cookie sheet, seam side down; brush top and sides with egg wash. Place decorative cutouts on top of each; brush cutouts with more egg wash. Place in freezer 5 minutes. Remove from freezer; bake 20 to 25 minutes or until pastry is golden brown and meat thermometer inserted in thickest part of beef reads 135°F for medium-rare (temperature will continue to rise to 145°F while it stands). Place on rack; let stand 10 minutes. Meanwhile, in 10-inch skillet, heat 1 tablespoon butter over medium heat. Add 2 tablespoons shallot and 1 clove garlic; cook and stir 1 to 3 minutes or until softened. Stir in 1 teaspoon mustard. Remove from heat; add broth, whipping cream and brandy. Heat to boiling over medium-high heat. Reduce heat; cook 6 to 8 minutes, stirring occasionally, until slightly thickened. Stir in parsley. 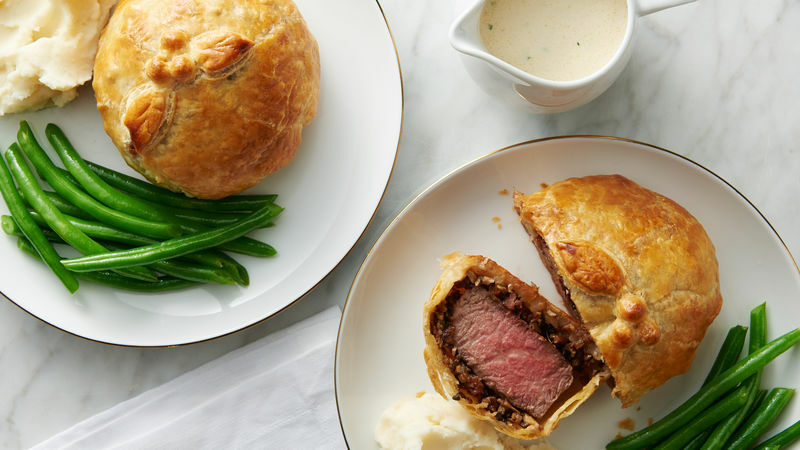 Serve sauce with Wellingtons. We call for 6-oz steaks that are 1 1/2 inches thick. If your steaks are thinner, you may want to adjust that time it takes to brown them, from 2 minutes a side to 1 minute a side for medium-rare. Placing the Wellingtons on a rack after they’ve come out of the oven will keep the bottoms from getting soggy.